Various and assorted things! 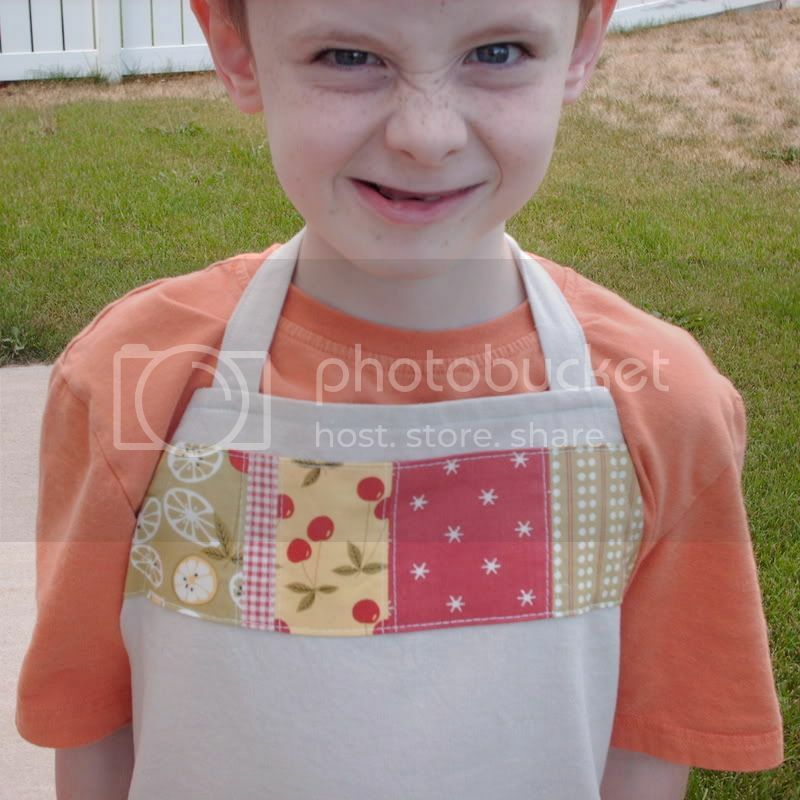 Including this: The apron, not the boy. 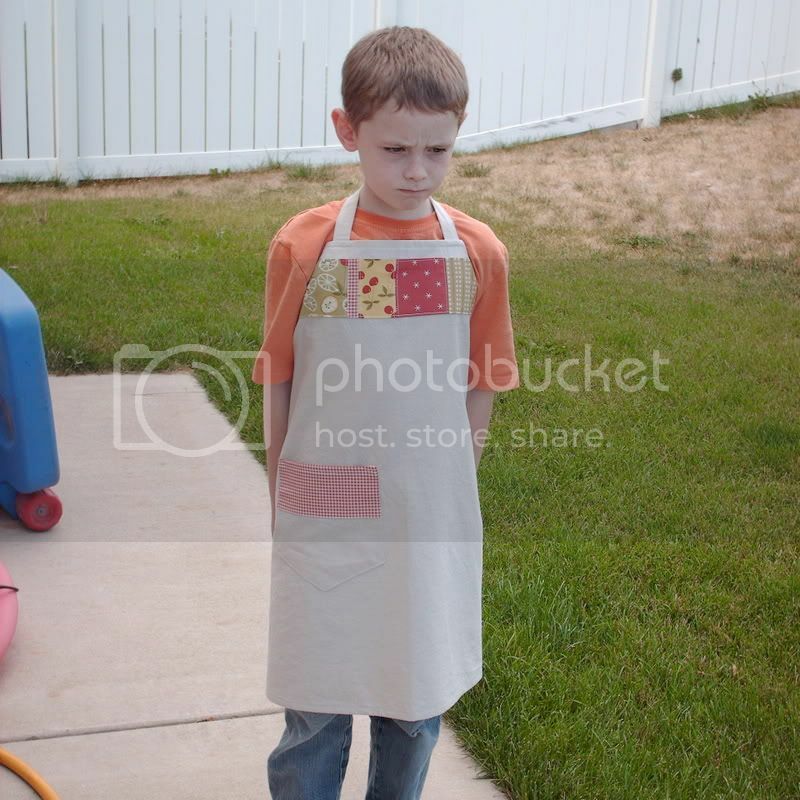 Because the boy's a bit cranky about having to model the apron. The giveaway will also include other goodies as the mood strikes me. Because we can all use more goodies! I was inspired by the RVA swap and need to get the giving out of my system. At least until Christmas. Plus, I want stuff I make to actually be used, instead of sitting in my finished projects pile, looking at me with forlorn eyes and a wounded heart. Oh, dear. Just leave me a comment and I will randomly select a winner (through my powers of random selection, i.e. my children picking a slip of paper with a name on it after I throw them all in the air)! This is a great way to delurk, by the way. I want to give you stuff, even if I don't know you. I'll take comments until, oh, let's say next Tuesday. How did I miss that you had this blog too? I love all of the cute things you have on here. I'm totally envious that you actually have time at home to be crafty....must find more time to craft. The apron is adorable and goes especially well with the pirate face. you know for almost being related I should just automatically win! Owen says "Wook, Beesen, was at? Fwower? Dak, Beesen play?" Translation: Look its Benson! Whats that? A flower? Jack and Benson need to come play"
how did you get him to put it on?? well done!! nice to meet you! So if I comment TWICE does that double my chances of winning! Hey, if Kara can post twice, can I too?